Aliases: "A Nut Who Goes Round in Pyjamas"
Base of Operations: New York?, U.S.A.
Powers/Abilities: Archie is a very good street sweeper, and fairly resourceful. 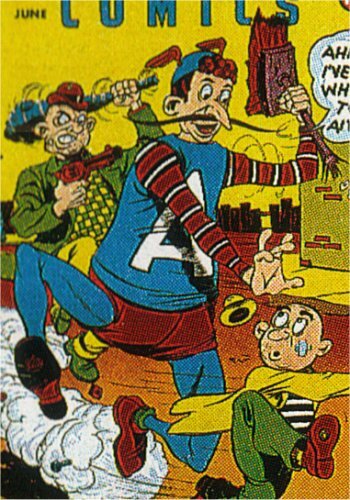 History: (Comedy Comics #10, ga) Inspired by the example of his hero, Captain America, streetsweeper Archie donned a costume loosely based on his idol's, and went out looking to fight crime. His first foe was fellow sweeper Big Joe, who had fallen off the straight-and-narrow.